Most Chicago Blackhawks fans are familiar with the name Mark Lazerus. He is a Blackhawks beat writer for the Chicago Sun-Times and is known for his entertaining articles as well as hilarious tweets. In his new book, If These Walls Could Talk: Chicago Blackhawks: Stories from the Chicago Blackhawks’ Ice, Locker Room, and Press Box Lazerus highlights everything from the Renaissance era of the Blackhawks. From the dark days in the early 2000’s where players handed out free tickets to games at bus stations to the sold-out crowds at the United Center in the mid-2010’s, Lazerus covers it all in vivid detail. Before, during, and after Blackhawks games, you can often find me on Twitter retweeting Lazerus and waiting for his story for the game to be published. He has been a beat writer since 2013 and has interviewed several Blackhawks players, coaches, and legends in his short time covering the Blackhawks. Prior to his career with the Chicago Sun-Times, Lazerus graduated from Northwestern University and went on to cover Notre Dame football as a sports editor for Post-Tribune in Northwestern Indiana. He took his journalism skills to Chicago and takes fans behind the scenes of their favorite team with interviews with players and in-depth game analysis. Lazerus also interacts with fans on Twitter, giving fans a more personal touch to their sports coverage. With his gift for interviewing and storytelling, Lazerus retells the story of the golden age of the Blackhawks so well it takes fans back to the very moment Patrick Kane scored the Stanley Cup-winning goal in overtime in Game 6 of the 2010 Stanley Cup Final. It takes fans behind the scenes into some of the most intense and historical moments of the Blackhawks franchise of the past few years. Fans will relish in the detail and anecdotes of the book. 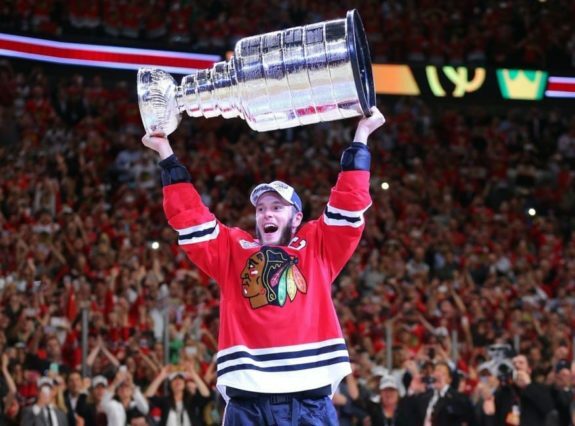 “Looking back a decade ago, I had no idea the Blackhawks organization would evolve into what it is today. We had missed the playoffs nine out of the previous 10 seasons. The office staff was small, the bare minimum, really. The franchise certainly didn’t seem like one that was on it’s way to glory. But I knew that if someone was able to come in and change a little bit of culture, the Blackhawks could be something great. The book continues with an introduction summarizing the “dark ages” of the Blackhawks in the late 90’s and early 2000’s. Former Blackhawks Adam Burish, Brent Sopel, Connor Carrick, as well as current Blackhawks Patrick Sharp and Brent Seabrook chime in on some of their not-so-fond memories of the early days. It continues into five chapters from the “dark ages” to present day, highlighting the three Stanley Cup victories of the 2010’s. Throughout the book, Lazerus highlights many fun and not-so-fun moments in the recent years of the Blackhawks. 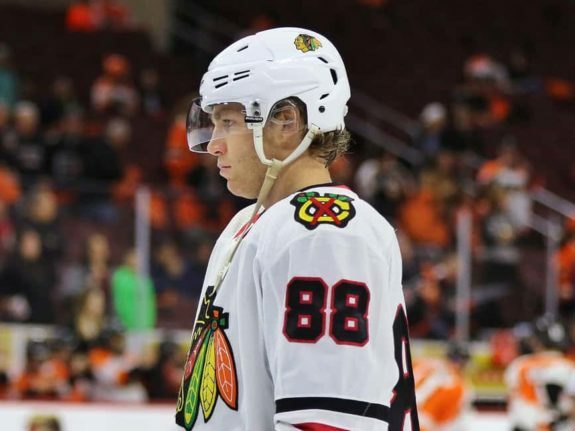 From the pranks of Sharp and Burish on Patrick Kane and Jonathan Toews prior to the 2010 Stanley Cup win that ended the 49-year championship drought in the difficult 2011-12 season, Lazerus tells it all. From the pure laughter and joy to the heartbreaking losses, no story is left untold. Lazerus continues with the funny anecdote, one of many in the book detailing what it is like to work behind the scenes in the hockey world, the side that fans don’t get to see. The details of what’s on the other side of the door will sure be entertaining for hockey fans. I give this book five out of five stars. This entertaining book perfect for all Blackhawks fans, or any fan of Lazerus’ writing. It is as entertaining as it is informative, giving Hawks fans a deeper look at their team than ever before. This book is the perfect gift for any Hawks fan in your life.